Parcours Trail 1.8 C 3 For a good workout, try this challenging hiking trail with numbered exercise stations. Alder Trail 1.4 B, C 1 Alder Trail leads through the woods to Alder Pond, where an accessible boardwalk takes you through a cattail marsh. The start of the trail, a short, half-mile, round trip section earns a Class B status that is good for visitors with wheelchairs, walkers, canes and strollers. Piney Woods Trail 2.0 C 2 Although this trail is named for the many pines once planted in the park, they are giving way to a variety of other species, including black cherries, oaks and tulip trees, through natural succession. 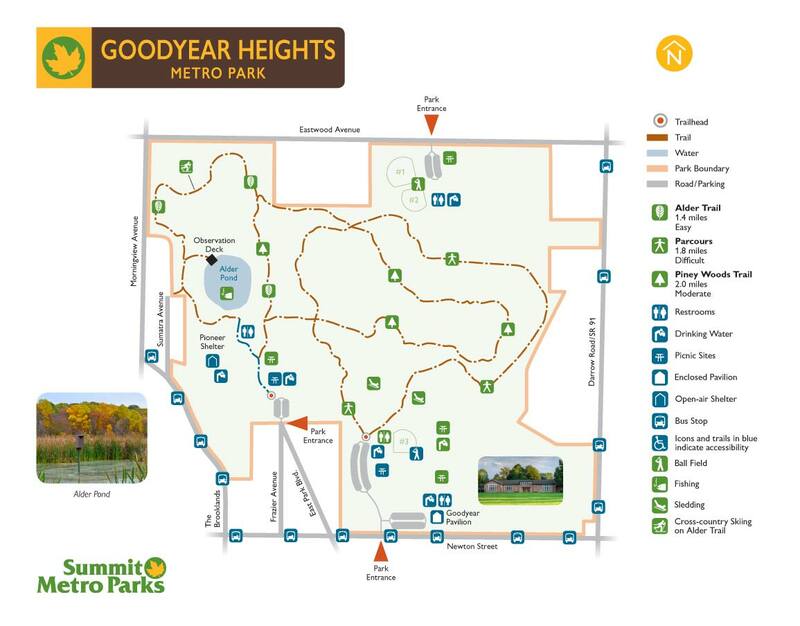 Goodyear Heights Metro Park opened in 1930 on land donated by Akron's Goodyear Tire & Rubber Company and land purchased from local resident Gilbert Waltz. During the Depression, Metro Parks acquired additional acres by paying delinquent taxes on surrounding properties. In the 1950s, the Goodyear Tire & Rubber Company donated more land, bringing the current total to 410 acres. Thousands of pines and tulip trees were planted in the park. During World War II, Victory Gardens were planted along Newton Street on the former Waltz farm. In 1957, Charles Goodyear Memorial Pavilion was constructed. It served as the park district's headquarters until 1974, when the offices were moved to Sand Run Metro Park. Today, pines are slowly giving way to black cherries, oaks and tulip trees through natural succession. 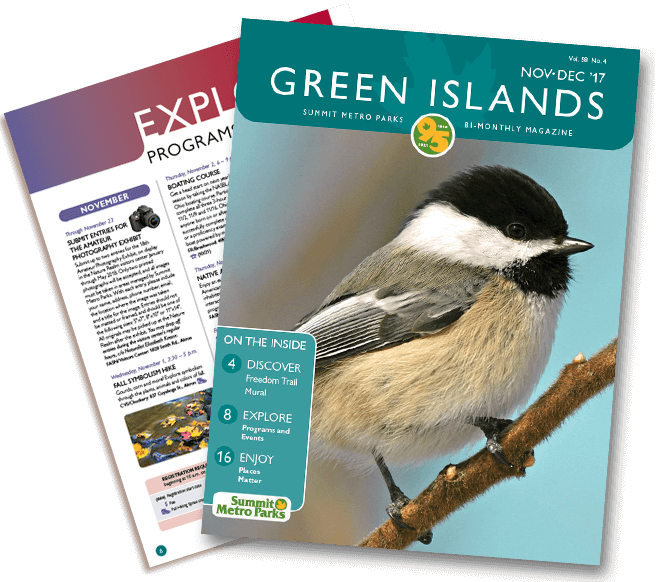 Elsewhere, beech trees, sugar maples, basswoods, pin oaks, red maples and blackgum trees grow. In the north-central section, acidic soils support sassafras and sarsaparilla, species that were once used in beverage making. Along the edge of Alder Pond, a cattail marsh provides refuge for a wide variety of wildlife, from Canada geese, red-winged blackbirds and Virginia rails to snapping turtles and muskrats. The pond also supports sphagnum moss and yellow birch trees. The park's woods are home to owls, red fox, raccoons and other wildlife.